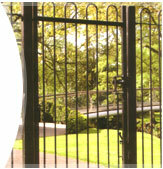 Steel palisade is growing more and more popular, with this popularity has come the desire for different colouring of the steel. Many people wish to change the colour of there fencing to suit there company logo or just to make the fencing look more appealing. Either way this colour chart was created to accommodate the customer’s needs. 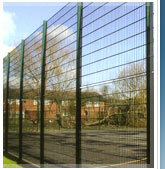 Steel palisade, certain mesh systems and vertical bar fencing can all be powder coated to suit. 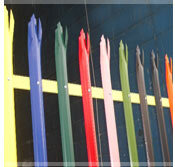 There are standard colours used by councils and other major business such as RAL 6005 Green, RAL 9005 Black, RAL 5010 Blue. There will be an extra over price for any other colour apart from the RAL 6005 Green, RAL 9005 Black, RAL 5010 Blue as stated.